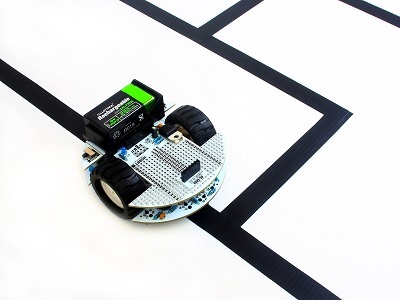 This kit allows you to build your very own maze solving robot. It comes complete with everything you need including all the electronics motors and sensors. 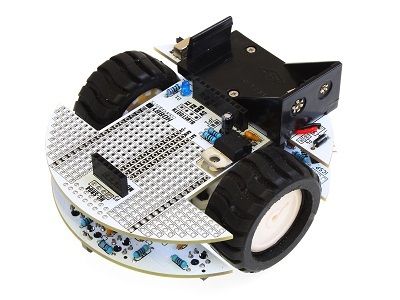 Just build the robot (soldering required), connect a PP3 battery (not included) and it's ready to go exploring. 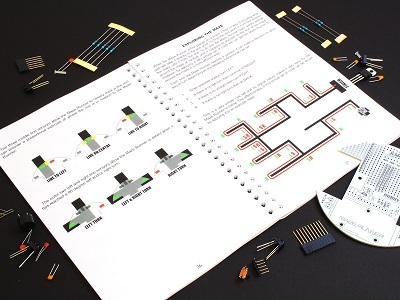 The kit also includes a book providing detailed instructions on how to build, commission, design a maze, and even program the Maze Runner yourself. 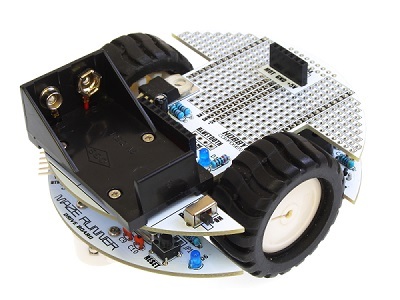 The Maze Runner is also designed to be compatible with the Arduino IDE which means with just the addition of a programming cable you can reprogram the Maze runner to follow your own commands. This opens the Maze Runner up to not just being a maze solving robot, but a general purpose robotic vehicle. To make reprogramming as easy as possible an Arduino compatible library can be downloaded from our support forum giving you access to the Maze runners hardware. The Maze runner also features a prototyping area should you wish modify the hardware, and headers to allow additional boards to be added. Please note: This kit contains electronic components which will require soldering. 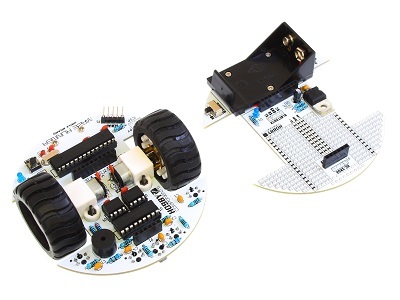 We have deliberately designed this kit to only use through-hole components to make soldering as easy as possible. To build the kit you will require a soldering iron, solder, some basic tools. Some experience in soldering through-hole components is recommended. Geared motors with larger tires providing plenty of traction. 5 line sensors for line following and turn sensing. On-board speaker for playing musical notes or tunes. 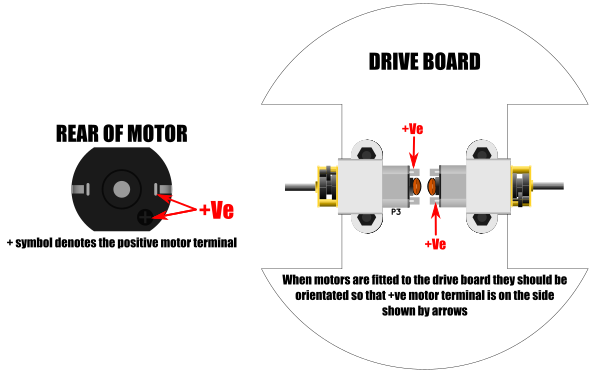 Highly maneuverable with forward/reverse drive and able to turn on its own axis. 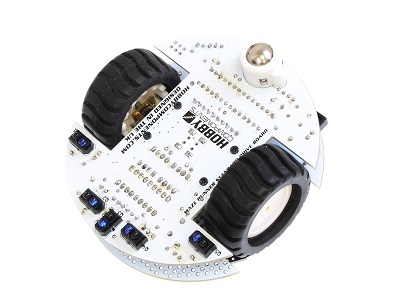 Pre-Programmed to explore and solve a maze - no programming skills required. Compatible with the Arduino IDE. Arduino library available to make writing you own code as easy as possible. Prototyping area to add your own custom hardware. Connections for optional Bluetooth and ultrasonic modules. Through-hole components to make construction as easy as possible. The library also includes example sketches including the default maze solving sketch that comes pre-programmed into the Maze Runner. User Manual Page 12: The two 10K resistors R9 & R11 are described with colour banding brown, black, black, orange, brown - the correct banding should be brown, black, black, red, brown. User Manual Page 24: The two 100K resistors R2 & R3 are described with colour banding brown, black, black, yellow, brown - the correct banding should be brown, black, black, orange, brown. Page 12 - The 10K resistors are described as "Brown, Black, Black, Orange, Brown" which is the colour code for 100K. Since there are a couple of 100K resistors for the other board, I think this might catch somebody out. The correct "Brown, Black, Black, Red, Brown" resistors are supplied. I assume the values are correct and the error is with the colour code description though these are incorrectly shown in the diagrams. These small things aside, It's an excellent kit. I really like the quality ring bound manual which reminds me of my 1982 Sinclair Spectrum manual! (that dates me a bit). A refreshing change in these days of multi-lingual scraps of paper in broken Engrish, or no instructions at all. Thanks for this. I've added them to the errata list and the manual will be corrected in the next print. I really like the quality ring bound manual which reminds me of my 1982 Sinclair Spectrum manual!